Casie Diana Stewart is a restless 26 year old artist, poet and blogger. She documents urban charity events, shopping excursions, and fashion parties. She writes about herself mostly, and describes her adventures cycling in Toronto, surfing (online & on waves), her art and assorted photography projects, sewing & making clothes, funky local stores, and twitter. She’s a pretty girl with a good sense of humour, and a very popular blogspot. Casie Stewart: this is my life has the byline, people . places . things . thoughts: in attempt to keep more memories, and that’s a good honest motivation for starting and maintaining a personal blog. This writer puts vanity aside and impresses readers with her candor, and her ability to relate details and get specific alongside her innermost thoughts. Casie has dual citizenship; Canadian and New Zealand. She once lived in Sydney Australia (Bondi Beach), Indiana, and New York. Her parents emigrated to Canada to raise their children, and Casie grew up in Cambridge, Ont. Casie says she’s always been artistic and entrepreneurial; when she was 14 she co-wrote an anthology of poetry and prose called Jeans. In 1996 she won the Miss Teen Pageant in Cambridge and the Young Entrepreneur of the Year in part because she was a founding member of the Cambridge Youth Council that opened a skate park, a drop-in center, and now celebrates the 11th year of the Rock the Mill festival. Casie spent two years working in the head office of “a large private retail organization,” and “had a great career as a Queen West hipster and party girl which lead to knowing alot of really cool & interesting people.” After she got tired of the party life Casie got into the Toronto tech community and joined forces with other tech-minded people to organize events such as #genyTO, Twestival, and Pay it Back Toronto. Casie Stewart’s most popular post was born last October when she explained her famous Toronto Sun September, 2001 Sunshine Girl appearance, and that’s understandable, check out the picture. This splash occurred about four months after her second most celebrated post, Blackberry Message Pending Problem which brought mass Google search traffic as thousands of other Canadians struggled with the same issue. And please check out Steamrolled By Drunkards because its easy to see why’s she’s loved as she relates a great story about visiting an event at the Steam Whistle Brewery to meet people she knows on Twitter. Casie’s Facebook When I asked Casie Stewart about the future of her blog, she replied, “The goal of keeping more memories is still the same. However, now I’m working more on creating a brand, and a following. No one besides me really read it for the first two years. Then, I went through some drama and said one day, ‘Hey, I’m a writer and I can do this. I’m gonna share this with everyone. I’m a blogger now’. Casie is a little self involved for my liking… Kudos on the do gooder part, but holy megalomaniac! Casie is absolutely amazing and fun. I love reading her blog and am always coming across new things. It kinda touches everything and there’s not just one specific focus which is what I love about it. 99% of the time I check the site, it has already been updated and there’s new content to read. Casie is awesome. End. 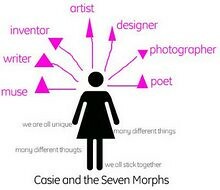 Love your blog Casie. Keep it up! Casie… not only does her blog provide endlesssssss hours of fun… her tweets somehow conveniently get posted when i need a good pick me up! and not just that… she’s totally friendly and always helps a sista out even though really… she’s never met me… I HEART CASSIE!!!! yr a blogspot queen. they will talk about U in grade nine history 50 years from now.. that’s cool!! I hope a kid from fiddy years from now asks his prof if those r real breasts.. u will have made a dent baby! Casie Stewart makes me feel like I’m hopped up on Tab and Champagne. AND…….she’s manslaughter hot (as in I would stab you in the liver to be with her). Casie is the rockingest blogger I know – she has a zest for life that is incredibly infectious – you can’t help but be pervaded by positivity and life when you’re around her. I’m proud to call her a friend, and I’m also proud to say that I read her blog religiously! I adore her. Her blog rules. CasieStewart.com in my hero. The blog is real and raw. No need for puffy professionalism, but rather a Toronto girl having fun, experiencing life and sharing it all without any sort of filter. Her candor is a breath of fresh air. Casie makes me want to be a better person. Keep up the great work Casie! Your blog always has the coolest new things on it, very entertaining! Thank you all so much for this great article and most of all, the comments. It’s inspiring to know you guys like me, you really like me! Keeping a blog as a way of extending memory is a great idea. I’ve often found myself searching my own blog to find out when something happened. The electrons swirling around the internet are way better at remembering stuff than my dumb squishy human brain. I would like to extend to you an invitation from Sandra Roberts, Publisher & Editor of PIE Magazine to an Evening of Regality. If you would like to be put on the guest list please e-mail me. Barrie – (Saturday, April 30, 2011) – Sandra Roberts announces a select lineup of stylish designers presenting Regality: The Society of Style at The Roxx Niteclub. Now in her 13th season, Stylist Sandra Roberts, for Pie Media Group, is taking a forward-thinking approach to the fashion society and is introducing new ways to best showcase Ontario’s high fashion designers and internationally renowned style icons. Model installations, fascinating exhibits and a high fashion runway show on our 50ft stage will offer attendees a surprising and unique way to absorb the evening. Video screens will showcase the behind the scenes making of Pie Media Group’s show as well as other short fashion films produced especially for the evening. The videos are guaranteed to compliment the stylish and sleek new look that the ROXX Niteclub has to offer while offering fashion lovers a digital front row seat. Pie Media Group’s Regality: The Society of Style is a culmination of arts and culture, creativity and functionality, fashion and the business surrounding it. Artists, sculptors, dancers and musicians have always been key players in the celebration of fashion. Pie Media Group serves as the connection linking these communities together to best represent the culture of the Canadian fashion industry and the international styling network. Pie Media Group is pleased to announce Barrie’s high fashion runway event featuring Hong Kong native Choryin Choi’s line Cydelic and Montreal’s stunning latex designs by Polymorphe. This event will bring also showcase body painting by Sean Avram of Bravo Body Art and the iconic avant-garde glasses from Mercurra NYC. Shoes are provided by Strap-on Sweetie. Pie Media Group will conclude with the first ever Northern Ontario performance by Yammel Carammel, Montreal’s beautiful silk and aerial performer who studied Aerial at École de cirque de Québec. Music performance by the legendary Bizune. Pulsatile Tinnitus – What’s causing that ringing in my ears?